Watching the Durham Attack Girls’ 16U Black Team progress during the season was a joy. Seeing them improve on their skills that we knew they already had, and witnessing them as they got stronger and better, was truly amazing. The question was – did they know how good they were? 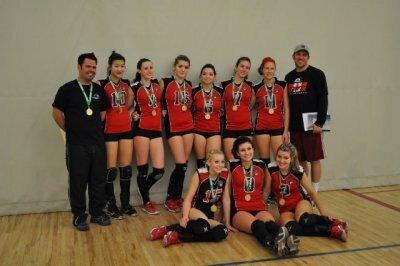 After coming in 2nd at 16U Provincials, this team became more confident and hungry for the win. This all became clear at East Nationals in Sherbrooke, Quebec, when they won the Gold. A gold medal win, however, wasn’t enough for the Durham Attack Girls’ 16U Black Team. This win made them even more determined to bring home another medal from West Nationals that took place in Calgary, Alberta from May 21-23. After day one and placing first in their pool, it looked like they were going to do just that. They easily beat teams from Alberta, Manitoba, and British Columbia with the closest score being 25-18. Day two brought on a little more competition. D.A. played our Ontario neighbours, South County Bandits, beating them 25-12 and 28-26. Our first loss of the weekend was against another Manitoba team, but the next set and tie-breaker were no problem for our girls. The sweetest win of the day, however, was against Alberta’s number one seeded team, the Pandas. The D.A. girls finished the day, by battling it out in a friendly game against each other at Laser Quest and then celebrating their successful day with a team dinner. On day three and the final day of the tournament, the girls were a little tired going to their earliest game of the weekend, however that was not apparent when they played the quarter finals match against FVVC from B.C.. They won both sets with scores of 25-15 and 25-21. Our semi-finals took us up against our rivals, Defensa from Ontario. Although it seemed that D.A. had the first set under control with a good lead, they were not able to hold on to that and lost. The girls also lost the second set and the chance at the gold medal. Despite the team’s disappointment, the Durham Attack Girls were able to come back in the last match, once again, against the Pandas, easily beating them 25-11 and 25-15 for the bronze medal. Congratulations to Anna Aguayo, Brianna Brunt, Taylor Bursey, Jaime Fryer, Ashley Hart, Julie Longman, Olivia Michaud, Layton Risto, and Kristine Yan. The girls’ parents are so proud of them and very grateful to coaches Kevin Hellyer and Mike Slean for an amazing season! Just a few weeks after capturing the Silver medal at the Ontario Provincial Volleyball Championship, the Durham Attack 16U Girls Black Team delivered a convincing win at the Canadian East National Championship in Sherbrooke, Quebec, bringing home the Gold medal. Over the course of the three days the girls played 18 games against teams from Newfoundland, Nova Scotia, New Brunswick, Quebec and Ontario. They advanced from pool play to power pool and then to the final game without losing a single set. The games featured amazing passing by libero Julie Longman and great setting by Brianna Brunt and Olivia Michaud. Excellent blocking by middles Anna Aguayo, Taylor Bursey and Layton Risto combined with powerful hitting by Jaime Fryer, Ashley Hart and Kristine Yan overwhelmed the competition. In addition to a National Gold Medal, Jaime Fryer and Olivia Michaud picked up an All Star Award, while Kristine Yan was honoured with the tournament MVP Award recognizing their contributions in this tournament. The girls owe their very successful season to veteran coaches Kevin Hellyer and Mike Slean, without whom this would not have been possible. The team continues to train for their last competition of the season at the Canadian West National Championship in Calgary the weekend of May 21, 2011. With three tournaments in four weekends, this is the first chance I’ve had to breathe, never mind write an article. You would think I was the one playing volleyball, but everyone knows the work that parents do in organizing our lives around our child’s volleyball schedule and preparing for weekend tournaments. 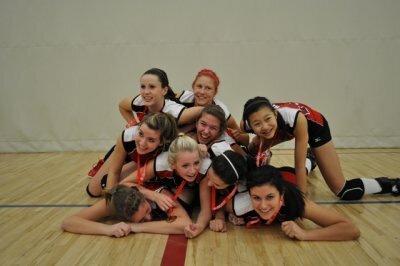 On March 26, the 16U Girls’ Black Team played in their last regular 16U tournament in nearby Oshawa. I’d like to take this opportunity to thank our 14U Girls’ Black Team for hosting. The 16UG team first went up against Peel Selects winning both games. They then met up with Ottawa Mavericks splitting a game each with them. The dreaded crossover game was against Interclub. After losing the first game, the 16U Girls’ Black Team won the next game as well as the tie breaker. Quarters against the Predators also went three games, but again our girls were strong enough to pull out yet another win. Again, in Semis, the girls went to three games against The Diamonds, winning the match. The 16UG Black Team were off to the Finals against Forest City Green. They lost the first game 18-25, but won the next one 25-23. The third game was a real nail-biter with our girls taking it 15-13 and winning GOLD – the first time this team has beat out FC in 5 years! I’m sure this was the highlight of the girls’ season so far. Up next was the 17U Provincials on the weekend of April 8-10. This was a great opportunity for our girls to get mentally and physically ready for their own Provincials. After coming in third in their pool the first day, they continued to push themselves, placing first in the power pool on the second day. On the last day of the tournament, they beat out Interclub 17U in the crossover game and then lost to Predators 17U in the quarters, tying for 5th place in 17U Provincials – Tier 1! Quite impressive! This past weekend (April 15-17), we knew the girls had their work cut out for them going up against the best in the 16U Provincials – Tier 1. The girls placed first in their pool on the first day and second in the power pool on the second day having only lost to Defensa. On Sunday, they had an early 8:00 a.m. crossover match against Waterloo. They lost the first game by only two points, but took the next two with ease (25-6 and 15-7). The girls then went on to beat Peel Selects in Quarters and South County Bandits in Semis. Finals took us up against (you guessed it), Forest City Green. Our girls were not able to beat them this time, but I think were still quite pleased with a second place SILVER finish. Anna Aguayo, Brianna Brunt, Taylor Bursey, Jaime Fryer, Ashley Hart, Julie Longman, Olivia Michaud, Layton Risto, and Kristine Yan. NATIONALS NEXT – BRING IT ON GIRLS! Durham Attack 16U girls were back at it in St. Catharines this weekend battling for position in the 17U top tier tournament. Coming off a silver medal win the weekend before in their own age group and ranking them second in Ontario, they were ready to prove themselves at the higher level. After losing a tough first match against Scarborough Nemesis, they rallied up against Georgetown Impact and finished second in pool play. The crossover game saw them easily beat the South County Bandits in two sets, 25-13 and 25-18. This brought them to the quarter final match against DRVC. It was a fierce battle. Durham Attack 16U lost the first set 23-25, but turned it around by winning the second set 25-18. The third set was tense, but our girls prevailed with a score of 15-13. In the semi-finals, they faced the Predators, the first-ranked team. In a very close and exciting match, they lost 23-25 and 18-25. In the battle for bronze they came out strong and beat Aurora Storm, 25-19 and 25-21. This win now ranks the Durham Attack 16U Girls Black Team third in Ontario in the 17U age group. Not bad next to their second place ranking in their own age group. Congratulations to the team who couldn’t have done it without the dedication of our amazing coaches, Kevin Hellyer and Mike Slean. Durham Attack 16U Girls Medal Again! The January 29th 16U Challenge Cup tournament in St. Catharines was interesting to say the least. Interesting in a good way. The Durham Attack 16U Girls Black Team came home with yet another medal, silver this time, only having lost to one team all day. Pool play started with the girls first going up against Selects Green. Although down in the first set, they were able to persevere, beating Selects 25-20. Great serving in the second set produced a much more solid win with a score of 25-11. Next up, was DRVC. Our girls took both sets, easily defeating DRVC 25-15 and 25-14. This placed our girls first in pool play. Quarter finals against Waterloo Tigers Black brought on intense drama. In the first set, DA Girls Black struggled a little and only managed to take over the lead at 16-15. They went on to win 26-24. The next set was also won 25-20. The drama began after this. This of course, pumped the Attack girls up even more, coming up against Interclub with a vengeance. After starting the set all over at 0-0, our girls were on fire and beat Interclub 25-11 and 25-18. We met up with Forest City in the Finals which was to be expected. The girls had a great start, but weren’t able to defeat FC, losing 18-25. The tables turned in the second set, and we finally took a game from this London team with a close 25-23 win. The tie-breaker game, however, went to Forest City with a score of 8-15. Great effort though. Congratulations to Anna, Taylor, Jaime, Olivia, Layton, Kristine, Julie, Ashley, and Brianna. That was some amazing volleyball! On Saturday, January 15, we woke up to quite the snow storm, but we didn’t care, we only had to go as far as U of T Scarborough for the 17U McGregor Cup tournament. The upside of staying in the Championship or Trillium Division is that for the most part, you don’t have to travel as far. Having said that, of course we wanted our 16U Girls Black Team to do their very best. Despite a slow start in Pool Play, the 16U Girls Black Team managed to beat Peterborough 25-17 in the first set. After cleaning up some of their serves, they had a more solid win in the second set with a score of 25-12. The girls woke up against Pegasus winning 25-13 in the first set. The next set wasn’t as great, and the girls gave that one up losing 22-25. I knew, however, that the tie-breaker would be ours. Yes, DA had a solid 15-9 win. Coming in first in our pool, we were able to avoid the dreaded cross-over game. Quarters brought us up again Storm Twister. Although the first set was won by only 26-24, our girls came out much stronger the second set, beating Storm 25-8. Next in Semis, we played the Georgian Cubs, and again won with scores of 25-12 and 25-20. The final match of the day was against Phenix. The girls lost the first set 17-25, but came back strong in the next two sets. Although very strong defensively, Phenix could not keep up with the onslaught of hits and we won the next two sets 27-25 and 15-11. A GOLD medal win moves the 16U Girls Black Team up to 17U Premier. Congratulations to the Durham Attack Girls 16U Black Team for bringing home their third medal in three tournaments. After a bronze medal finish at the McGregor Cup Premier tournament in Welland, Ontario on January 8th, the team is now ranked third in Ontario in their age group. The team finished a convincing first in pool play, despite the absence of veteran setter Brianna Brunt. 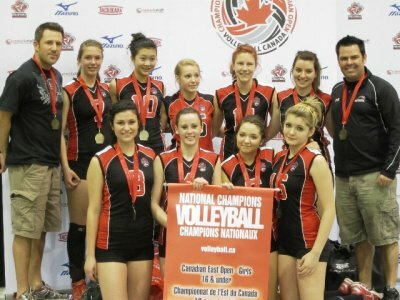 The team beat both the Ottawa Mavericks, last year’s East National Champions, and our ongoing rival, DRVC. Pool play featured strong hitting by Jaime Fryer, Ashley Hart and Kristine Yan. They met the extremely tall Toronto Diamonds in the quarter final match, beating them in two close sets; 25-22 and 26-24. In the semi final match pitted them against the strong Defensa team. After winning the first set 25-19, they were unable to hold their lead, losing the next two sets by small margins. Excellent setting by Olivia Michaud and tough blocks by Anna Aguayo, Taylor Bursey and Layton Risto almost put us through to the gold medal match. The girls played a strong bronze medal match winning against the Toronto Interclub Black team in three sets. Julie Longman displayed incredible defensive skills as Libero. 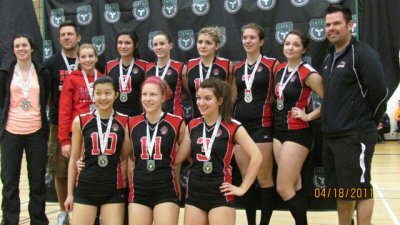 The team is looking forward to winning a medal of a different colour at the next 16U Premier tournament at the end of January.